A schoolboy who survived a summer holiday horror cliff fall will return to the classroom this week after making a miraculous recovery. Robbie Drew, 15, resumed his studies yesterday – six weeks after the ground crumbled beneath his feet, sending him crashing onto rocks below. The youngster, of Marshall Wallis Road, South Shields, was plucked from Manhaven Bay, at the Leas, South Shields, after a two-hour rescue operation on August 2. Rushed to the Royal Victoria Infirmary in Newcastle, surgeons operated to treat a severe wound to his left knee, including ligament damage. The Newcastle United fan has since undergone a skin graft on the knee and may require further surgery. Robbie Drew returns to school after his cliff fall. Robbie, who spent two weeks in hospital, has told his parents he is keen to get back to Mortimer Community College, South Shields, and start his final year studies. Mum Lizzy Stavers, 43, said: “All things considered, he’s doing really well – it could have been a whole different ball game. “He’s out of hospital and just wants to get back to school and get on with his work. “He has to go to hospital twice a week to have his dressings changed and so we will have to work around that, but he is keen to resume at school. “Robbie has had some homework sent to him and is being well supported by teachers, including being allowed to wear shorts in the classroom because of his dressings. “He does face some possible reconstruction of his knee, but at the moment he doesn’t want to go through another operation. Robbie was throwing stones into the sea with a friend when the lunchtime accident happened. It was just three days after his mum and dad, Neil Drew, 44, had given him permission to play near the cliffs for the first time. He has told them he remembers thinking “I’m slipping” as the ground gave way. The teenager is thought to have been knocked unconscious during the fall, waking to find himself lying on rocks and his left knee shattered. He crawled a short distance away from the cliff, where his cries for help were heard by passers-by and the alert raised. The incident also left him with bruising to his chin and cuts to his chest and back, and a severely swollen left ring finger. Miss Stavers, a children’s social services worker, maintained a 24-hour vigil at his hospital bedside. Doctors fear he may also have damaged growth platelets and have warned this may cause a deformity if not corrected. Robbie has been encouraged along the road to recovery by visits by pals at the two football clubs where he plays. Friends at Harton and Westoe have already presented him with a Newcastle United shirt, and he has also met Jarrow Cougars. Miss Stavers and Mr Drew have another son, Kieron, 17, an apprentice engineer. Jason Ainsley, Head of Year 11 at Mortimer, said: “I followed Robbie’s progress through hospital, and it’s great to have him back with us and sooner than expected. “It’s a big year for him, and he’s very keen to get back to school and to finish his final year of studies. Mortimer headteacher Simon Hignett added: “It is absolutely fantastic to see Robbie back at school. When you actually think what he and his family have been through, the fact that he is back in school and attending South Shields’ matches in such a short space of time shows his determination and resilience to come through such a horrific accident. Robbie’s cliff fall set mum Lizzy and dad Neil off on a desperate 10-minute dash to the clifftop. Reliving the ordeal, she told the Gazette: “I did fear he would die, we were getting frantic. 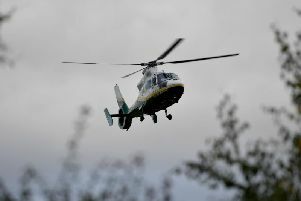 “When we got to the Leas, we saw the emergency rescue helicopter still in the sky and knew it must be looking for him. “One of Robbie’s friends signalled to us where he was and we rushed down with a first aid kit we had from the car. “The rocks were very slippy, and Neil got to Robbie first, there was a lot of blood and he told me his injuries were bad. “Robbie has told us that he thinks the ground just gave way. He doesn’t remember the fall and thinks he must have been knocked out. “He does recall coming round and finding himself in a cave. He then remembers crawling about 10ft to where his shouts for help were heard. Miss Stavers, a children’s social services worker, added: “Robbie thinks that he is both lucky and very unlucky. “He has said that he is thankful that he landed on his knee and not on his head. “Neil went back the day after to have another look and the tide was in, it could have been a lot worse. “Robbie and his friends have vowed never to go back and play on the cliffs. “We really want to thank all the emergency services and the people who were at the seafront who helped.